WordPress had its inception on May 27th, 2003, when Matt Mullenweg and Mike Little forked the b2/cafelog platform, originally written by Michel Valdrighi. Christine Selleck Tremoulet, a friend of Mullenweg, suggested the name “WordPress.” It wasn’t until May 22, 2004, when the third release of WordPress, named Mingus (v1.2), was released with support for a new feature named “Plugins”. Previous to this release, if a user wanted to extend WordPress or add specific features, they did so by using “hacks” created by themselves or others. Hacks came as a set of bundled files, along with instructions on what core WordPress files to edit and where to insert code. 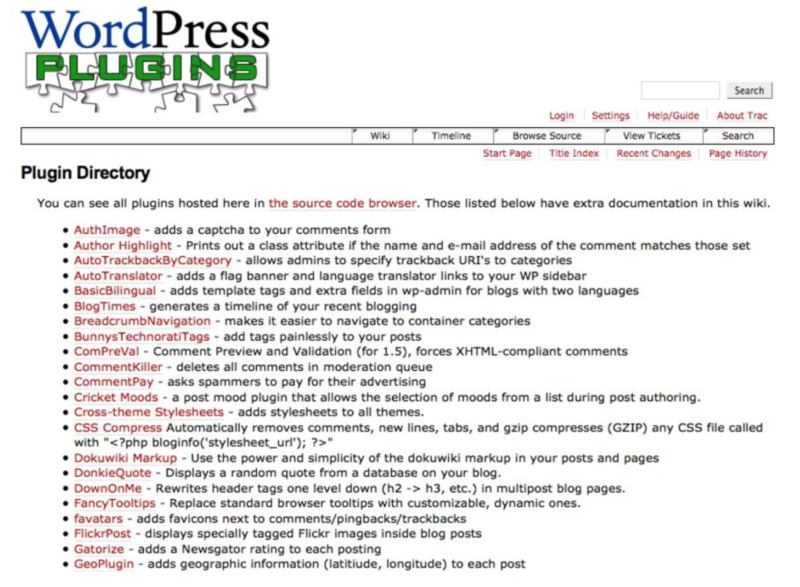 The plugin system was the idea of Ryan Boren, who had quietly contributed to WordPress early on. In short, he suggested using a system of Hooks and Filters in the core software that would allow developers to “hook into” specific events that happen in WordPress and run their own custom code. This custom code was in the form of a plugin in a separate directory from the core files within WordPress. This initial plugin functionality was added to trac on March 25, 2004. There was no longer a need to edit core WordPress files, which meant that WordPress could be upgraded more easily without the risk of losing your customizations. Non-technical users no longer had to edit files, copy/paste code, and could now simply Activate or Deactivate the specific functionality that a plugin provided. In the years since, the entire WordPress ecosystem has continued to mature and so has the business sense of those making premium plugins and building the brands around them. We’ve seen authors go from selling a plugin or plugin add-on for a one-time price, to now more commonly offering yearly subscriptions that auto-renew. As of this writing, there are 52,479 free plugins in the official WordPress plugin repository and that number is growing each day. As WordPress itself continues to push the boundaries of making website and blog creation even more accessible to non-technical users, the need for, and availability of plugins will only increase. And speaking of plugins, have you tried our SiteLock plugin yet? If you have a WordPress website, we can help ensure it’s secure and protected. Learn more about how to use the SiteLock plugin here.